Community Board 2 is holding a Public Hearing on the Borough Based Jail system ULURP application for a large new jail to replace the detention center at 275 Atlantic Avenue. 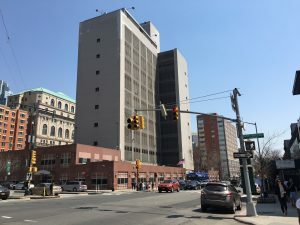 In the week since Community Board 2 (CB2) first announced its public hearing on the “Borough-Based Jail System” ULURP applications, several people have expressed disappointment that the hearing is not being held closer to 275 Atlantic Avenue, the current and proposed sites of the Brooklyn detention facility. At a stakeholder meeting earlier this year, a civic leader predicted that this public hearing would draw as many people as came to the ULURP hearing on the “80 Flatbush Avenue Rezoning.” Perhaps as many as 200 people were turned away from that hearing when the auditorium at St. Francis College was not large enough. This unforeseen and unfortunate circumstance had never happened before and cannot happen again. The community board’s first priority is to ensure that everyone who wishes to attend and participate at a public hearing has the opportunity to do so.There are a limited number of public spaces large enough to accommodate a group larger than the 300-seat auditoriums at the downtown post-secondary schools. Two of the venues that CB2 contacted were already booked and a third asked for $8,500 in usage and other fees. The community board is grateful to Bishop Loughlin Memorial High School for hosting the public hearing. Bishop Loughlin Memorial High School is 15 minutes by train, including walking time to and from the subway station, from the Brooklyn Detention Complex. It is a half-hour walk and a 10-minute bike ride. If this topic is of interest or concern to you, Community Board 2 hopes that you will join us next Thursday in Fort Greene. Community Board 2 is holding this hearing to provide the public the opportunity to comment on these applications. Notice of this public hearing will be publicized in The City Record. Community Board 2 will send this notice to the local and citywide press and addressees on the board’s distribution lists. Community groups and individuals representing all segments of the community are encouraged to participate. Want to receive updates from the BHA? Join our list.